A "collaborative syllabus" is one in which the students have the ability to help determine the specifics of a course. Those specifics can be any element that a professor is willing to be flexible with (such items as the objectives, grading, attendance policies, types of assignments, and so on). The logic behind this tool is that by actively participating in the creation of the syllabus, students are able to signal what they want to learn and how they want to learn it and then (potentially) set the standard by which they will be accountable. An instrument that has been successfully used before, the collaborative syllabus suffered in one crucial area: It required too much class time to create it. Being unfamiliar with the concept, students first had to have it explained to them in one class period. Following that, there would be several sessions where they would discuss their thoughts, vote on what to incorporate/exclude, and edit the existing document. Given the constraints of the typical 15-week semester, every session is dear, and it is difficult to lose one to such a process, let alone three or four. 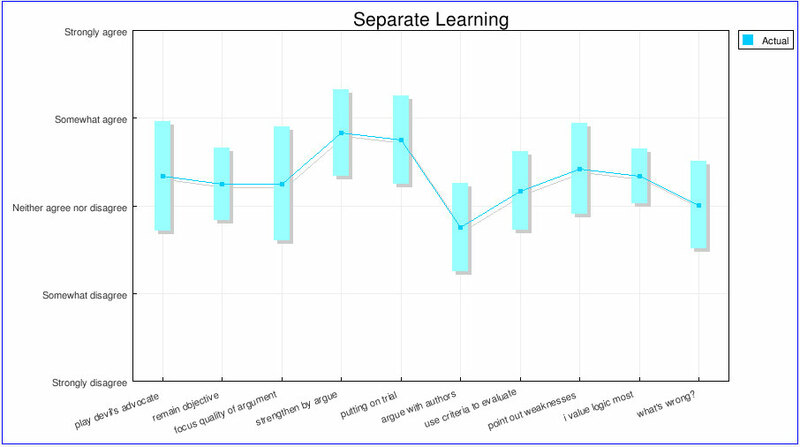 In pursuit of a better approach that saved class time, we at Anderson University turned to Moodle for an experiment. The more input students could have in the process outside of class, the more class time could be saved for covering the material. Given that, the creation of the collaborative syllabus was then approached in a three-step process. This article details the steps taken, and the results of walking through this process. Traditionally, a large number of students at Anderson University who take the eBusiness course in the fall then take the eCommerce course in the spring (the course for which the collaborative syllabus is being created). With four weeks to go before the end of the fall semester, students in the eBusiness course were asked to access the ATTLS survey in Moodle and answer the questions asked as openly and honestly as possible. 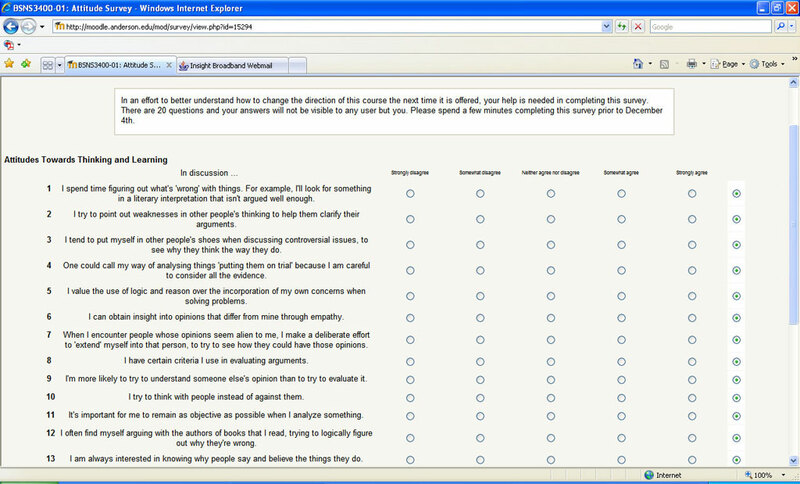 Moodle includes the ability to administer this instrument utilizing a 20-question, five-point Likert scale as shown below. In an effort to better understand how to change the direction of this course the next time it is offered, your help is needed in completing this survey. There are 20 questions and your answers will not be visible to any user but you. Please spend a few minutes completing this survey prior to December 4th. The students were also verbally told that the purpose of the survey was to be the first step in the creation of the syllabus for the upcoming eCommerce course; this served as an additional incentive for those students signed up for that course to complete this. Of the 22 students enrolled in eBusiness, 12 completed the survey. 1.By an overwhelming margin, students preferred three exams. 2.The preferred priority was: Exams, Participation, Projects, Presentations, Quizzes, and Attendance. 3.The results on the percentage question were too diverse to be meaningful. This left me with using the results from the second question as a proxy during this phase. 4.Answers ranged from "I honestly have no idea what I want from this class" to specific issues involving Web site creation, moving from brick and mortar to eCommerce, and so on. 5.By a slim margin, students preferred the 93-100% range for an "A", and this could be attributable to it being the standard scale used at this university.